Mobile phones were once a device used exclusively for communication, then through the years, cameras and other components have been added until we finally reach 2019; at this point you can do almost anything a regular PC is capable of, including serious gaming. That’s where SteelSeries steps in with the new Stratus Duo, offering a more natural-feeling way to enjoy mobile games rather than using awkward touchscreen controls. Titles such as Fortnite Mobile and Real Racing 3 are touted as offering full support. The Stratus Duo is a full-size gaming controller that also offers full Windows compatibility through Steam’s vast catalogue of over 5000 controller-enabled games. Back in 2015, we looked at the Stratus XL which also offered a similar layout along with Android and Windows support, so you may be wondering what make this new iteration any better. Well, the main changes come in the form of improved ergonomics, providing additional comfort as well as 2.4GHz support, which gives a more stable connection than Bluetooth. Not only that, but SteelSeries have used higher quality components such as Hall Effect magnetic sensors in the triggers and analog sticks. Arriving with a price tag of £59.99 in the UK, and similar in other parts of the world, the obvious competition within the Windows environment is the Xbox One controller which is widely available for £44.99 at most retailers, however, for your extra £15 you do receive a couple of important extras; a built-in lithium-ion battery, which offers over 20 hours of gameplay and a 2.4GHz USB dongle for a more stable experience. While we look at the controller itself, we’ve also been provided with an optional SteelSeries SmartGrip. 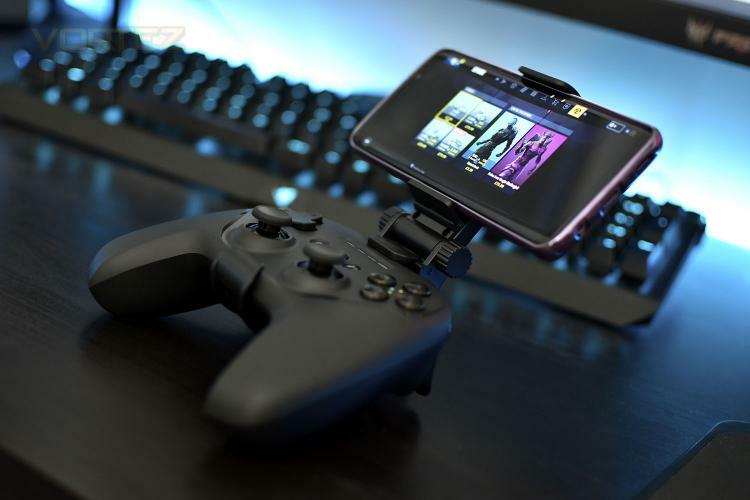 The SmartGrip is compatible with most phones ranging from 4” to 6.5” in size and marries the phone and controller together for a more enjoyable experience. The SmartGrip is available for £9.99/$9.99. Hall Effect magnetic sensors are much more durable than their traditional counterparts, allowing for flawlessly smooth actuation from top to bottom, and clickable analog joysticks give you pinpoint 360° precision with minimal dead zone, whether you’re carefully aiming or button mashing.